When thirty-eight-year-old Ian Thorson died from dehydration and dysentery on a remote Arizona mountaintop in 2012, The New York Timesreported the story under the headline: "Mysterious Buddhist Retreat in the Desert Ends in a Grisly Death." Scott Carney, a journalist and anthropologist who lived in India for six years, was struck by how Thorson’s death echoed other incidents that reflected the little-talked-about connection between intensive meditation and mental instability. Last year I read and reviewed Carney's The Red Market about trade in humans and their various body parts. It was great, but I think this is the book that has cemented him as a must-read author for me. His reporting style here is very similar to Krakauer's Under the Banner of Heaven. He takes on a specific case of an inexcusable death and uses it to examine the entirety of Tibetan Buddhism, focusing in on one particular guru and the cult that sprung up around him. It's incredibly detailed and accessible to all readers, including those who are unfamiliar with the concepts of Buddhism. As detailed as he is with his explanations of the religion, its history, and its practices, he also manages to keep the pace active and the reader involved in the story. My one other note about the writing is that it's obvious that Carney has done his research and spoken to a variety of sources. In addition to references, he includes detailed notes on each chapter describing who he spoke to and where the information came from. It's incredibly helpful from a documentation standpoint, and also serves to provide an interested reader with a jumping off point for further study. Cults in general fascinate me, but all of the cults I've read about have largely centered around a Judeo-Christian worldview (Jim Jones, who started as a church, the FLDS church, etc). I was thrilled to have a chance to see a cult that centers around something so completely different, but that works in the same ways. I couldn't believe how such disparate religions could become cult followings so similarly. At the same time, it made sense, particularly when paired with Carney's observation that cults tend to form in any religion when mystical experiences take precedence over religious traditions. 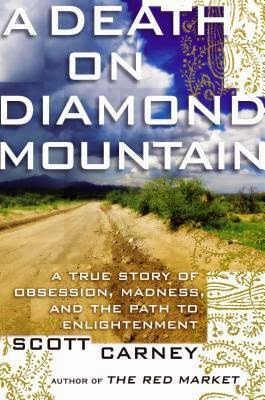 I thoroughly enjoyed my read of this book and would recommend it to anyone who is interested in cults, Tibetan Buddhism, religious extremism, or even true crime. Carney is an author who is now officially on my radar and who I'll be watching for in the future. Thanks to Roshe and Gotham Books for providing me with a copy to review.